. : Eastern Cup Opener in Rikert, VT :: Ski XCOttawa.ca :: Skiing in Ottawa and Gatineau Park :. This past weekend, a small contingent of XC Ottawa headed south of the border to test ourselves against some of the toughest competition in the eastern United States. The race was located less than half an hour from Middlebury, VT at the Frost Mountain Nordic Centre, and they pulled off a spectacular event. Sheila, Katie, Ingrid, Kyla, and Mark all made the trek down in addition to hundreds of racers from numerous universities and clubs throughout the eastern region. We first arrived to ski the course on Friday afternoon and were greeted with excellent, but icy ski conditions. Frost Mountain has snowmaking for a 5km loop and over 40km of total trails. The 5km race course involved many tricky corners and long, gradual climbs. After skiing, we quickly settled into our wonderful rooms at the Middlebury Inn. A view of the stadium on Saturday morning. Saturday dawned bright and sunny and we made our way up to the trails for a 5km classic for the ladies and a 10km for the men. The fields were large, with over 180 women and 170 men. Sheila lead the team with an 18th place finish. Ingrid was close behind in 19th, Kyla in 35th, and Katie in 125th. In only his second year of ski racing, Mark came 171st. Kyla looking snazzy in our new Podiumwear suits. Note the yeti on her right thigh. Katie pushing to the finish. Mark striding up one of the hills. Sunday morning was the much anticipated 10/15km mass start skate. It was a unique opportunity to start alongside 140+ skiers; something that we never get to do in Canada. The women's race didn't disappoint in terms of excitement levels, as there was a pile up at the front of the pack 200m after the start. Ingrid was the only victim of the carnage (luckily avoiding any broken poles/bones) while Katie, Kyla, and Sheila managed to dodge the massive group hug. The pack slowly spread out, but there were always skiers in front, beside, and behind to keep you moving. In the end, Sheila posted the top result for XC Ottawa in 25th. Ingrid followed in 38th, Kyla in 49th and Katie in 98th. Mark's race went much more smoothly, without crashes right off the start. Mark skied a strong 15km and finished the day in 173rd. The team would like to thank Chelsea Nordiq for adopting us for the weekend and waxing our super fast skis! We are now preparing for World Junior Trials in Duntroon, ON from Jan 8-11. Race Report: 2006 National Championships: Relays! CSM: Celebrate the 46th CSM! 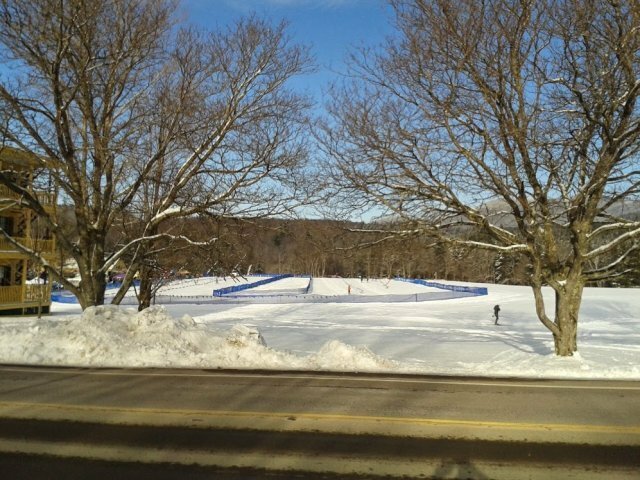 XC Local: Ski Heritage East Secures Seed Funding and Grooming Begins!